When you are on the Internet you face a dilemma. You do not know an awful lot about new sites that you visit. You do not know much about the company or people that operate a website for instance. That may not be a problem on sites that you just access for information, but what about shopping sites or sites where you enter personal information like your email address? You'd probably want to know if you can trust a site with those information. Website reputation services in theory speed up the time it takes to come to a conclusion. Instead of having to search for information on search engines you could use their ratings to assess a website's reputation more easily. Experienced Internet users know that it is often not sufficient to use just one service for that. These services can be manipulated easily, for instance with fake user comments and ratings. Webutation is a meta service that lists ratings from multiple services when user look up domain names on the website. 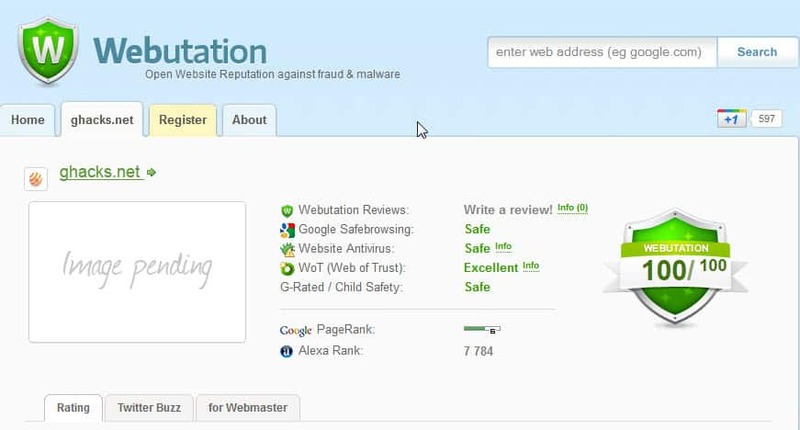 The reputation service includes its own review service as well as the site's Google Safebrowsing, Website Antivirus, Web of Trust and G-Rated / Child Safety rating. These ratings are then used to calculate the Webutation score. You also see the site's Google Pagerank and Alexa rank listed there. Some entries have an Info link next to them. If you hover your mouse cursor over them you will see additional information about the rating. The only other option that you have is to switch from Rating to Twitter Buzz to see some of the recent Twitter messages that references the domain name. I personally like Webutation as it combines the rating of multiple reputation and security services. It is still recommended to rely on other sources, e.g. a manual web search for issues related to the domain. A Firefox add-on with mixed reviews is available as well. It basically displays the webutation rating of the active website in the browser's toolbar. Are you using reputation services? If so, which is your favorite? Update: The service has been modified in recent time. While it is still displaying some of the information such as a site's WOT rating, it is not displaying page rank or Alexa rank anymore. The important information however are still displayed which means that you get information from various services that have rated the url you have entered. Webutation is a free Internet service that you can use to look up security and privacy information about websites. I use Avast WebRep, WOT and Norton Safe Web Lite. There is a bookmarklet out for the service? It depends on your needs. If you want all pages evaluated you should pick the Firefox add-on, if you only need some pages (manually) evaluated use the bookmarklet. The latter does not consume any memory when not in use. I have been using WOT firefox extension for a while now. I discovered webutation not long ago, and I have been using the website to double check. First of all thanks for your post. I did the registration of my company’s website and I add an image of our logo in the profile. Unfortunately, I still have “image pending” on the public view although I change the Facebook privacy settings. Can you help with this? It’s very important. You will have to contact the operators of the site, I cannot help with that unfortunately. Thanks a lot for your answer Martin. I tried to contact them and they didn’t answer me. I’ll try again. I use Virus Total Chromizer – if I’m not mistaken, following your recommendation, Martin, some time ago. The extension seems to be very reliable. Besides, I use WOT and Avast Safe Web. I had also the Norton toolbar with Identity Protection and safe browsing but – maybe because of the Chrome version, 32, or their new policy of allowing only extensions provided by their WebStore – it stopped working. Regards from Brazil.